French toast and pancakes soaked in syrup and sprinkled with berries and powdered sugar make my mouth water. And when I’m on vacation, you best believe one of these treats is on my menu. But, you know what? Eating these on their own can make a great day go downhill quickly. So I always make sure to add a “secret” ingredient: protein. You see, as delicious—and common—as all-carbohydrate breakfasts are, they also have the potential to totally derail your afternoon and evening. Reaching for a muffin, Danish, whole-grain toast, or even a fruit bowl on the go in the morning can set you up for irritability and poor decision-making hours later. Definitely not something I want, whether I’m on vacation, hanging out at home with my family, or trying to get work or other tasks done. But there’s an easy fix: Add some protein. Swapping one slice of French toast for some eggs or egg whites, sausage, bacon (especially turkey bacon), Greek yogurt, cottage cheese, lean steak, or whey protein powder can help you stay relaxed and level-headed and lead to better decisions throughout the day. 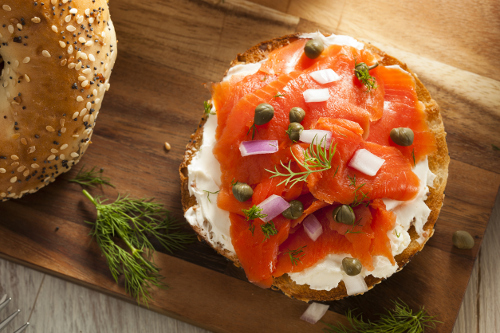 So, if you notice a tendency to get cranky by noon, adding some smoked salmon and cream cheese to your bagel could be the solution. Older studies have shown that eating protein in the morning can regulate ghrelin (the hunger hormone) to suppress cravings for starchy foods and keep you feeling full—and likely help you make better food choices all day. Because, as I’m sure you know, when that hunger hits, all bets are off! The latest study is indicating that what you eat for breakfast plays a role in how you treat and react to others. For the study, researchers tested how people would react to being treated unfairly. One group was fed a carbohydrate-heavy breakfast prior to playing the “Ultimatum Game,” where their opponent had been instructed to make unfair offers. Another group played the same game and got the same offers, but was instead fed a high-protein, relatively low-carb breakfast. The results showed that those who were fed the carb-rich breakfast were far more likely to lash out at their opponents. And those who had protein with their breakfast were far more likely to handle questionable situations calmly and diplomatically. Protein for Breakfast: A Mood Booster? The reason for this tactfulness, according to the researchers, could be that breakfasts higher in protein lead to the production of tyrosine. The amino acid is a precursor to dopamine, a neurotransmitter that plays a role in decision-making. If you’re capable of making a better decision, you’re probably unlikely to feel the pressure of challenges and attack others. Furthermore, the fact that protein can regulate appetite means it can also keep blood sugar from crashing and the hunger pangs from kicking in, which can also boost irritability. Next time you’re feeling a little crabby or find yourself becoming irritated easily, try including some protein in your breakfast and throughout the day. It can make your days a bit better, improve relationships, and make difficult moments less stressful. “Your pancake breakfast could be making you cranky” CBC News, June 24, 2017; http://www.cbc.ca/radio/quirks/drowning-wildebeest-mobility-exoskeletons-dna-privacy-and-more-1.4173942/your-pancake-breakfast-could-be-making-you-cranky-1.4173971, last accessed July 6, 2017. Blom, W., et al., “Effect of a high-protein breakfast on the postprandial ghrelin response,” American Journal of Clinical Nutrition, Feb. 2006; 83(2):211-20; http://ajcn.nutrition.org/content/83/2/211.full, last accessed July 6, 2017.